— Barbee hasn’t watched a lick of film from last season. “It doesn’t matter,” he said. I guess that makes sense from the standpoint of starting the program from the blankest slate, the scratchiest scratch possible, but I also guess it means that Barbee doesn’t think much of Jeff Lebo’s methods. From how they represent themselves on campus, how they represent themselves in the community, how hard we work on the floor, how hard we work in the weight room. 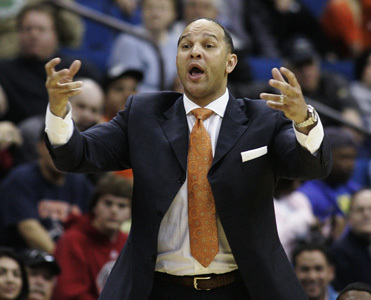 — It’s not too tough to read between the lines when Barbee’s asked about scheduling and responds that his team will need to build confidence: it’s Cupcake City, at least for 2010-2011. And frankly, for a year at least, I’m perfectly OK with that. Barbee’s first squad isn’t likely to be NCAA material regardless, so getting the Tigers’ feet underneath them will be much more important than trying to make a dent in the RPI. When I got this job, I all of a sudden had 1,000 new friends in this business that I didn’t know I had. They said to ‘Hire me because I can bring player XYZ.’ But that’s not what I’m about. Family is about loyalty and taking care of one another. That is a philosophy I endorse 100 percent. It’s impossible to recruit in modern college basketball without wading through at least a little bit of skeeze, but the less we can track into Auburn Arena, the better. Overall, Barbee comes across as supremely well-spoken and confident, and my classroom quibble aside, there’s precious little not to like. There’s even more at the two links. Check it out. Lemaybe not. Not much going on on the Auburn krootin’ front, what with the Tiger Prowl kiboshed and a bit of a calm hitting the scene before the storm of Big Cat Weekend 2: Pie-Eating Contest Boogaloo*. Kris Frost is still saying nice things. Tide commitment Brent Calloway is planning on attending BCW2, which is the sort of thing the Coachbot and Co. usually frown on. That’s about it. Aside, I guess, from QB Christian Lemay’s announcement that he expects to sign with his official leader, Georgia. Certainly not unexpected, but Auburn fans might have hoped to have been one of Lemay’s two additional “finalists”–essentially, the schools Lemay will still visit and consider if the roof caves in on Richt and Bobo this fall. Didn’t happen–Lemay cited Clemson (as expected) and Texas A&M (less expected) in those two slots. With both Jeff Driskel and Lemay off the board, Auburn’s down to two of their original four quarterback targets–Kiehl Frazier and C.J. Uzomah. The odds remain good, I’d say, that Chizik and Co. will snag at least one of the two (particularly if Malzahn sticks around for another year), but there’s less margin for error now before looking at a Plan B. — I’ve been saying for weeks that Hoover was a done deal, but after taking two in Fayetteville and with Auburn’s closing schedule, it really is a done deal. — Auburn is is sole possession of third in the SEC West, a game ahead of defending national champion LSU, and the two teams ahead of the Tigers (Arkansas and Ole Miss) play each other this weekend. A divisional itle is absolutely now in play. — As is hosting one of the eight NCAA Regionals. It’s possible that the season-ending series in Oxford could give the head-to-head winner an inside track on a Regional. — Helping Auburn’s case is that their three remaining series are at home vs. hapless Miss. St., at home vs. not-hapless-but-not-good Tennessee, and the aforementioned road series at overrated Ole Miss. An 8-1 finish to the season and 20-10 final SEC record isn’t likely–I’d peg 7-2 as the most probable outcome–but it’s not out of the question, either. So: good times. War Eagle, Tigers. You guessed correctly. Read the rest at your first opportunity. Elsewhere, here at TWER, Jeremy has a new edition of Bo Bits. Seriously, by this point “Bo Knows Blog” is making the Tim Teblog look half-assed. Etc. Andy Bitter breaks down the Auburn special teams … catching up with the oft-traveled Kyle Davis. *I spelled “Boogaloo” correctly on my first try. I’m so proud and ashamed of myself. But I do think you’re picking nits about the grade stuff. I don’t think he meant having a good attitude at the Chick-Fil-A and Starbucks when referring to “how they represent themselves on campus”. Do you? The first thing I think of is when I read that line is not going to class without brushing your teeth, not cutting in the cafeteria line, not yelling at your girlfriend over the phone in the middle of Foy. But yeah, I’m not going to plead innocent on this charge. My only objection with anything he said in the whole interview is that he kind of acted like our players didn’t already represent themselves well on campus and in the community. But I guess that’s just any new coach’s job. They’re supposed to fix everything, even if some of it’s not broken.